Despite the fact that we live in the digital age, cookbooks remain more vital than ever. Passed down through the generations and perfect for gifting, cookbooks are an authoritative repository of our favorite recipes. Even if they’re only used for decorative purposes, a beautifully designed cookbook feels deliciously decadent. Taking you from cozy American kitchens to the famed bistros of Paris, from the sunny shores of the Mediterranean to the streets of Manhattan, these scrumptious cookbooks will inspire the avid and the reluctant home cook alike. This beloved classic has been teaching generations of Americans how to cook for seventy-five years—it has answered countless kitchen questions and averted many a culinary crisis. An essential for home chefs of all skill levels, this anniversary edition offers endless choices for virtually every occasion, situation, and need. For the seventy-fifth anniversary of the Joy of Cooking, Joy comes full circle in a revision based on the 1975 edition which restores the voice of the original authors; focuses on American home cooking, not chef cuisine; and restores many beloved recipes lost in the most recent revision.Seventy-five years ago, a St. Louis widow named Irma Rombauer took her life savings and self-published a book called The Joy of Cooking. Her daughter Marion tested recipes and made the illustrations, and they sold their mother-daughter project from Irma's apartment. Today, nine revisions later, the Joy of Cooking has been selected by The New York Public Library as one of the 150 most important and influential books of the twentieth century and has taught tens of millions of people to cook, helped feed and delight millions beyond that, answered countless kitchen and food questions, and averted many a cooking crisis. Bringing the color and vibrancy of Mediterranean dishes to the dour English kitchen, Elizabeth David revolutionized British cooking in the mid-twentieth century. This is the first time her beloved vegetable recipes have been collected in a single volume, and this beautiful cookbook is a must-have for anyone wishing to give vegetables a starring role in the kitchen. Ina Garten can do no wrong in my eyes. And with her cookbook FOOLPROOF, she’s making sure you can do no wrong in your kitchen. I salivate over recipes for Spanish Pea Soup, Lobster Corn Fritters, and Ultimate Pumpkin Pie with Rum Whipped Cream. For those of you thinking these sound insanely complicated, fear not: the Barefoot Contessa is there helping you each simple step of the way, and the stunning photos will entice you to get to the finish line. The finish line…where there’s cake. If you’ve been on the Internet in the last decade or so, odds are you’ve fallen in love with Deb Perelman’s irresistible blog, Smitten Kitchen. Known for creating delicious and delectable meals from her tiny Manhattan kitchen, Deb brings her trademark warmth, candor, and can-do spirit to this long-awaited cookbook. Michael Pollan, the author of The Omnivore’s Dilemma, has changed the way Americans think about food. Now his mother and three sisters invite you into their warm and inspiring kitchens with The Pollan Family Table, a cookbook that will help you create delicious, nourishing meals and cultivate traditions that bring families back to the table. Two of the world’s most respected chefs were born in Jerusalem in the same year—Sami Tamimi on the Arab east side, and Yotam Ottolenghi on the Jewish west. 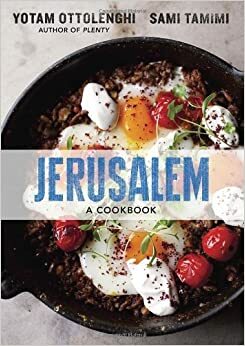 In this beloved cookbook, they have produced a unique cross-cultural exploration of the city’s diverse and vibrant flavors, which ranges from inventive vegetable dishes to sweet, rich desserts. In Jerusalem, Yotam Ottolenghi and Sami Tamimi explore the vibrant cuisine of their home city—with its diverse Muslim, Jewish, and Christian communities. Both men were born in Jerusalem in the same year—Tamimi on the Arab east side and Ottolenghi in the Jewish west. This stunning cookbook offers 120 recipes from their unique cross-cultural perspective, from inventive vegetable dishes to sweet, rich desserts. This acclaimed cookbook was one of the first to trumpet the nutritional benefits of the world’s healthiest cuisine. Rich in flavor and healthy nutrients but low in saturated fats and cholesterol, here are recipes that will delight your palate and nourish your body and soul—and that can be prepared with ease in your home kitchen. Parisian culinary culture has transformed since Julia Child brought French cuisine to the post-war American masses. A new generation of chefs and home cooks now incorporates ingredients and techniques from around the world into traditional French dishes. Here, David Lebovitz remasters the classics, introduces lesser-known fare, and presents one hundred sweet and savory recipes that reflect the way modern Parisians eat today. Whether you love Gwyneth Paltrow or hate her, this cookbook is kind of fantastic. Celebrating the joy of preparing food for loved ones, this luscious collection of ideas for breakfast, sandwiches, soups, salads, main dishes, and desserts will inspire readers to cook great food with the people who mean the most to them. This award-winning cookbook will help you relax and enjoy yourself in the kitchen as you prepare delicious meals for every occasion. With Mark Bittman’s straightforward instructions and advice, you’ll make crowd-pleasing food using fresh, natural ingredients, simple techniques, and basic equipment. ALICE’S TEA CUP used to be the place to test out your afternoon-tea manners on Manhattan’s Upper West Side while being showered in confetti. While they still offer a fantastic tea service, they’ve since expanded to serve every meal of the day. This cookbook features the restaurant’s classic pumpkin scones and a selection of tea sandwiches, but it also offers recipes for main dishes, sides, and even clever Mar-Tea-Ni cocktails.